The church was built in Gothic style on the foundations of an older, most likely Romanesque, church. Its current Baroque appearance dates back to 1727 – 1731, and the tall thin octagonal spired tower is an indelible part of the Lesser Town skyline. The church is a part of the Augustinian monastery, and both its size and interior decoration rank it among the most important Prague churches. Masses are also held in English and Spanish. The Gothic church was established by Václav II in 1285, on the foundations of an older, probably Romanic church, for the Augustinians. This gift from the king and the consent of Prague Archbishop Tobiáš conditioned their coming to Prague; the monastery was built next to the church. Most of the original Romanic church disappeared due to the new building - only the former Northern wall was preserved. In the early 14th century, the monastery was an educational centre, where the members of the Order got education, and later on (until the Hussite era), it was probably even included in the University. The building was completed in 1379; the frescoes preserved in the vestry date back to a period around the mid-14th century, and they were probably created upon an impulse of the Olomouc Bishop and Chancellor to Charles IV Jan of Středa, who was a great promoter of the monastery. 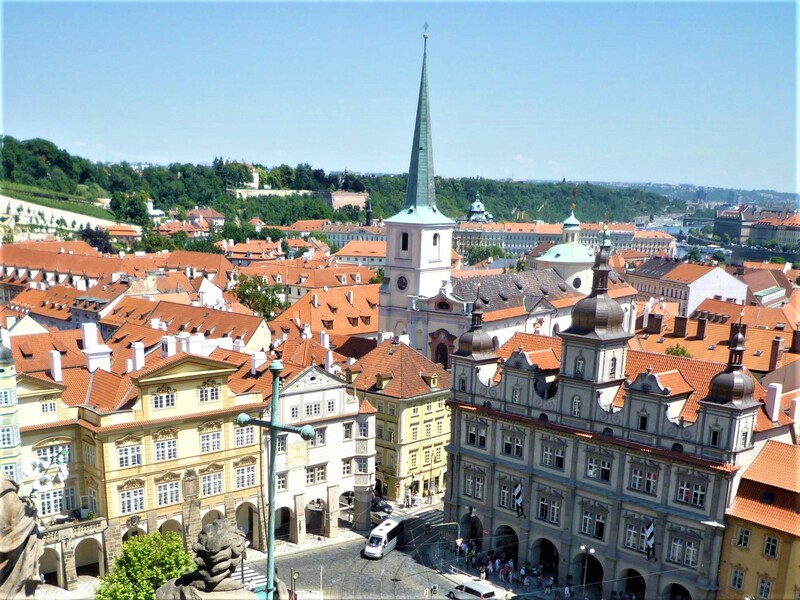 In the Hussite era, the monastery was burnt down and nearly destroyed (yet the valuable library was preserved), and the church was also damaged, but it was one of the few in Prague to remain Catholic. The friars then faced lack of money, and some greater restorations only started at the turn of the 16th and 17th centuries in Renaissance style. For example the altar painting of St. Sebastian by Bartholomeus Spranger was created in this period. The monastery was on very good terms with the Court of Rudolf II, and prominent courtiers were buried here, as well as Rudolf’s court architect Ulrico Aostali and sculptor Adrian de Vries. During the Thirty-Years’ War, the monastery was forced to sell part of the land plots with the estates, but at the same time, the church decorations continued - in 1637, the main altar paintings by Peter Paul Rubens arrived - Martyrdom of St. Thomas and St. Augustine on the Sea Shore (today, the originals are deposited in the National Gallery). 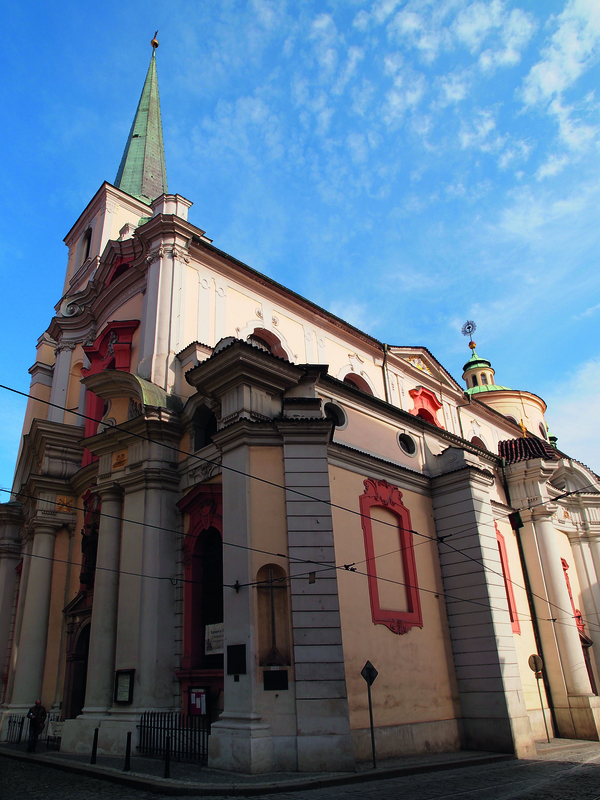 In 1723, the church was damaged by fire, which broke out after a lightning stroke, and the subsequent reconstruction (1727 - 31) was assigned to Kilián Ignác Dientzenhofer. His first design was very radical and also too expensive for the Augustinians, and so they agreed that he kept the original ground plan and the Renaissance portals, and he modified the front, the vaults, the domed vaults of the chancel, and he decorated the existing constructions. During the 19th and the 20th centuries, the church was only reconstructed. The facade is mostly shaped in Baroque with some preserved Renaissance details; constructionally, the Gothic origin of the building can be seen. There is a statue of St. Augustine by Jeroným Kohl in a niche above the portal. Above the Renaissance portal made of red marble on the side facade, there is a statue of St. Thomas made in the Kohl’s workshop (the style reminds of Matěj Václav Jäckel, who at that time probably worked at Kohl’s as an apprentice). The ceiling of the main aisle is segmented into 5 fields conched via plates with frescoes painted by Václav Vavřinec Reiner - scenes from St. Augustine’s life: taken from the entrance, there is St. Ambrosius baptising the saint, St. Augustine defending the Catholic doctrine, St. Augustine washing Christ’s legs as a pilgrim, the saint covering with his cope (coat) the Augustinian rules, apotheosis of the saint carried by angels. In the dome, there is a painting of Christ and St. Thomas with the apostles, surrounded in the pendentives (transition between the base and the dome) by allegories of continents. On the ceiling of the chancel, there is a fresco covering 3 fields, depicting St. Thomas teaching the pagans, with apostles at the grave of Virgin Mary, and in front of the Ceylon prince. There is a space adjoining the chancel from the North, where the oldest Gothic frescoes have been preserved - a composition Arma Christi, and a painting of St. Hedvika in the adjoining vestry. From the South, the chancel is next to the Chapel of St. Dorothea, which is conched via a wagon vault on the ground floor and rebuilt in Classicist style on the first floor. The side aisles are conched via cross vaults, which probably date back to the Renaissance reconstruction of the church. Regarding the inventory, there is namely the remarkable main altar according to a project of Kilián Ignác Dientzenhofer with copies of paintings by Peter Paul Rubens, sculptural decorations by Jan Antonín Quitainer, and wood carvings of St. Augustine, Monika and Ludmila by Ferdinand Maxmilián Brokoff. The altar of St. Sebastian depicts the Martyrdom of the saint by Bartholomeus Spranger. The opposite altar of St. Roch is decorated with a painting of the saint with angels by František Xaver Palko and statues of St. Cosmas and Damian, again by J. A. Quitainer. The remaining two altars in the chancel have a form of portals, and they contain paintings of the Holy Trinity and the Assumption of Virgin Mary by Karel Škréta. We can find another excellent painting by this man on the first altar in the side aisle on the right, viewed from the entrance, consecrated to St. Thomas of Villanova. The opposite altar of All Saints is decorated with wood carvings of angels, putti and winged heads by the group concentrated around Matěj Václav Jäckel; on the sides of the altar pedestal, there are statues of St. Roch and Sebastian by Jan Jiří Bendl. Early Rococo pulpit with a surface made of artificial marble bears Quittainer’s little statues of putti, among which there are reliefs with parables about Good Shepherd, there is a relief named Sower on the staircase balustrade, and the Sending of the Holy Spirit in the rear part of the rostrum. On the shed, there are four figures of the Church Fathers - St. Ambrose, Gregory the Great and Jerome, with St. Augustine at the very top. An apostle, patron of architects, building crafts, or theologists, helps relieve back pains. When Christ died, he worked as a missionary in India and Persia, where he died as a martyr (stabbed by a pagan). The saying “doubting Thomas” reminds us that he did not want to believe in Christ’s resurrection until he laid his hand on the wounds after the crucifixion, thus convincing himself that it really was Christ.